Our Tech Seal Team Is Devoted to Helping You Complete Your Most Challenging Missions. Architect availability, reliability and performance into your business. Maximize your resources to grow your business. Transform your IT to be vigilant against evolving threats. Take a breath and relax with Managed Security. Enable productivity while remaining secure in the mobile world. Stay connected in a mobile world. Build reliable voice, video and web communications. Enhance productivity with managed communications. 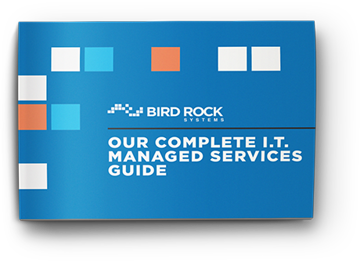 24/7 Advanced Managed Services gives your IT team the ability to refocus their expertise, time, and energy to the critical initiatives asked of IT to help business grow in an ever changing technology environment. Bird Rock Systems helps a large international Resort grow to 8 locations through a wired and wireless infrastructure refresh.